Tomb of Oedon is a Lamp in Bloodborne. 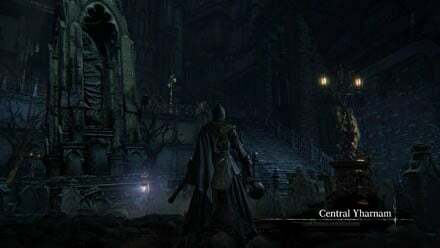 It is within the Central Yharnam location. Just before entering the Cathedral Ward, on the table directly to your left, on it's far side, is a glowing papers, with small information about Byrgenwerth. it reads: "The Byrgenwerth spider hides all manner of rituals, and keeps our lost master from us. A terrible shame. It makes my head shudder uncontrollably." You will access this area from the sewers or from the shortcut via an elevator coming from the Central Yharnam Lamp. The bridge has a mob of enemies that can be defeated via the flaming boulder that the brick troll releases. The Lamp hosts the Father Gascoigne boss fight, as well as an event for NPC Eileen the Crow, to defeat the hunter Henryk. If you die while fighting Henryk with Eileen, and go back to the lantern and successfully kill Henryk, there is a chance the lantern will never be accessible again. Eileen will also stay at this lantern until the next moon phase, but the lantern stays inactive. For some reason, After killing Rom the Vacuous Spider, the lamp here ceased to function. I had already killed Henryk long ago and haven&apos;t advanced Alfred&apos;s questline. I inspected the lamp in person and while lit, for whatever reason, it isnt interactive.